Having been ground down almost beyond endurance by the referendum ‘debate’, I was surprised and delighted to be picked up so splendidly by Pop-Up Opera’s Barber of Seville. The Thames Tunnel Shaft might not, on the face of it, have seemed an obvious venue for Rossini, but neither I, nor, I suspect, anyone else had any doubts, let alone complaints, once down the steps. The intimacy of the occasion more than compensated for any acoustical issues; my ears soon adjusted, and all that remained was to sit back and enjoy. The performance was sung in Italian, with silent film-style titles projected on the wall (sometimes text and translation, sometimes translation, sometimes commentary, sometimes wittily and only vaguely ‘after’ the original). Soloists and piano (with a mercifully brief outing for deliberately-inappropriate synthesiser as Figaro’s guitar) well-nigh perfectly captured the often elusive essence of Rossini’s opera. In all but the best performances, it can readily seem over-extended, even tedious, the composer’s clever formulae all too quickly losing their sparkle. Not here; indeed, I am not sure I have witnessed a more committed performance. Berrak Dyer’s sterling work on the piano was such that I never missed the orchestra; indeed, in conjunction with those titles, the sound of the piano seemed especially apt. James Hurley’s stage direction and the work of a fine team of producers (see above) left nothing to be desired. Disguises were donned, simple props telling employed, but above all, it was the characters who came so vividly to life – both as opera buffa types, which is surely crucial here, but also with a degree of humanity that yet did not sentimentalise. For that, of course, we have primarily to thank a highly talented cast of young sisters, all of whom I should more than happily see and hear again. Rossini’s technical demands held no fears for any of them, nor did the quicksilver stage action that must accompany, indeed incite, it. Katie Slater’s coloratura impressed greatly as Rosina; so did her knowing glances. Ciarán O’Leary, suffering from an allergy, nevertheless made the most of the first act as Almaviva, revealing a lovely tenor voice, and technique to match; having had to withdraw, he was ably succeeded by the similarly accomplished, eminently likeable Joseph Doody. James Schouten’s handsome baritone proved another joy to hear as Bartolo. Tom Asher – who, I have just noticed from the programme, hails from my home town of Rotherham, and is therefore necessarily a good thing – revealed excellent comic and musical talent as Basilio and Fiorello. Emily Blanch, long relegated to the sidelines in her role as Berta, nevertheless made the most of her aria, warmly received. If I had to choose, though, my first prize would go to the outstanding Leif Jone Ølberg as Figaro. Ølberg inhabited the role at least as completely as any artist I have seen. His baritone voice is darkly attractive, seemingly effortlessly agile, capable of all manner of subtlety – and he can act. Such an energising presence would have melted even the sternest of hearts. If he were first among equals, though, that achievement would never have registered without so fine a sense of company from all concerned: on and off stage. 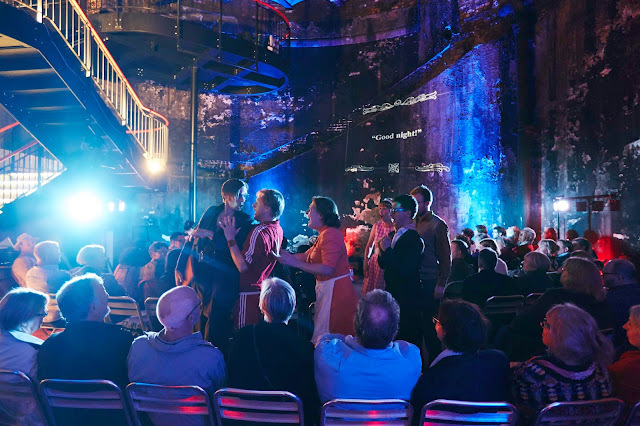 The most heartening opera performances often to be found where you least expect them, even at the foot of a tunnel shaft. 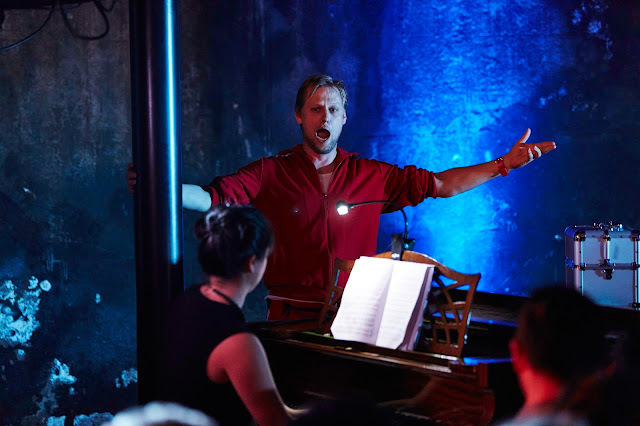 For details of Pop-Up Opera’s nationwide tour, please visit their website here.